Smart ForTwo Cabrio Running Costs, MPG, Economy, Reliability, Safety | What Car? It makes sense to keep the Fortwo Cabrio as cheap as possible when looking to buy, no matter whether that’s via car finance, cash or through work. Okay, so the step-ups through the trims isn’t a huge financial commitment, but the Fortwo already looks on the expensive side versus competition such as the Fiat 500C and Peugeot 108 Top!, even at its cheapest level. Essentially, it makes less sense the more expensive it becomes. As such we’d say the less-powerful version of the 0.9 three-cylinder engine is the one to go for, while Passion trim realistically has everything you need at the best price. If possible, we’d spend the little extra it costs to have Smart’s Comfort Pack, though, because that gets you electric mirrors and driver’s seat and steering wheel height adjustment, which will help keep you pain-free on longer trips. Happily, while the Smart might be quite expensive to buy, it shouldn’t prove expensive to run. Its tiny tyres and engine will be cheap to fuel, tax and service, while insurance, even for young drivers, should prove relatively cheap. 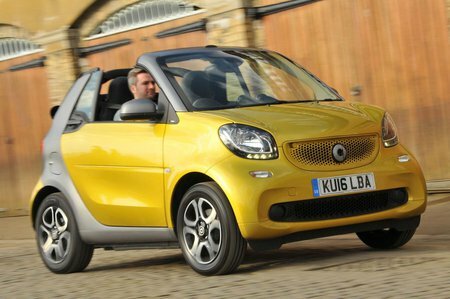 The Smart Fortwo is one of the better city cars at hanging onto its value, too.